Travelling is one of the fantastic hobbies that many people in the world fancy or are enthusiastic about. Travelling is fun. You should make it more interesting by having a plan of all that your journey will entail. Whether you are going on a holiday trip, family vacation or an adventure with your colleagues or friends, you have to make the journey as enjoyable as possible. Besides getting an opportunity to interact with new people as well as see new places, travelling also offers you a chance to read the best books ever written. When you are always busy or your days are filled with demanding and exciting activities, you will find it hard to read. Many people find it easy to read when they are bored at home or stuck at the airport. At times, it is wise to find great travel books and enjoy your journey. Travelling is a great adventure to undertake, and you should make it as interesting as you can. There is no better way of doing so than packing the best books at your disposal. 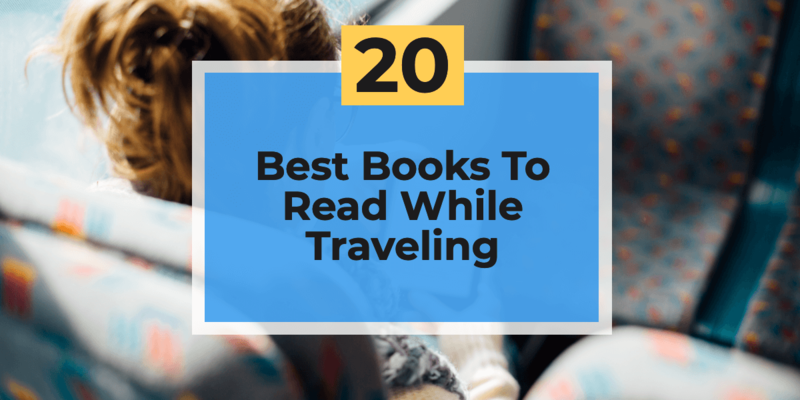 If you have great fun reading books especially when you are travelling, you have to keep in mind that books can also take up your time and space. Try and save extra money for your trip by buying second-hand books at your next door books store, local library or thrift store. It is a great idea to buy books set in the areas you intend to visit. Don’t take too many books with you. Go for one or two books that will get you through your destination. You might discover or come across new books during your travels. If you are not travelling alone, feel free to pick books that you can easily swap or exchange with friends and share more. Some cities have amazing libraries which provide books for long distance travelling, so you don’t need to pack every book you own in your bag. Find free book websites that connect travellers with fellow book lovers in a community they intend to visit. Shantaram is an excellent piece of work and an enjoyable read by Gregory David Robert. This novel will without a doubt grasp your attention and keep you alert during your journey. The book follows a tale of an escaped bank robber and heroin addict of Australian origin, who escaped from the Pentridge Prison and fled to India. The book explores his life in Bombay where he falls in love with crime life and all sort of criminal activities. He goes on to learn about local cultures and customs. Shantaram is a great read and more so if you are visiting India for the first time. If you are an avid reader, then you must be a great fan of J.R.R Tolkien work, and you must be a great lover of The Hobbit. The book covers the adventures of Bilbo Baggins, a hobbit who enjoys a comfortable and unassertive life. He is whisked away by a group of dwarves on an adventure. The adventure is filled with surprise and irresistible humour. You will most definitely fall in love with The Hobbit tale. Elizabeth Gilbert’s masterpiece book, Eat, Pray Love brings echoes of enlightenment, joy and smiles to your journey. It is a great book that will make you develop and grow as a person and as you travel from one destination to another. This is a fantastic book that has impacted the lives of many readers. Ready to travel? Don’t forget to pack the non-fiction book Into the Wild written by Jon Krakauer in your backpack. It’s one of the incredible books I can read on a coach, and you should try it out too. You will not have any regrets. It is a great book that addresses many issues facing our societies these days. For instance, it looks at the issue of how to be accepted into society and how finding oneself does not go well with societal values. In essence, you will find perfect kind of enlightenment reading the book. If you enjoy reading and more so when travelling, Sense and Sensibility by Jane Austen is a great book. It’s a remarkable book if you are planning to visit England during your vacation or regular trips. The characters and the plot of the book expound more on the moral significance of the book and why you should read it. Probably you have come across travellers sharing great lessons from The Alchemist; a one-of-a-kind novel by Paulo Coelho. The book follows the travel escapades of a young Andalusian shepherd heading to the pyramids of Egypt following a dream to find a treasure. The book has inspired many readers in the world, and you should make it a must read during your trips. It will encourage you to live your dream and find incredible ways to overcome any obstacle in your endeavours. Once you read this book, don’t forget to take actions and change your life. If you are an avid follower of Alex Garland work, don’t hesitate to pack The Beach in your backpack. It followers the story of a traveller in search of an isolated beach that has not been explored by any tourist. The Beach has also been adapted into a movie, and you can imagine how amazing it can be to read the book and watch the film. This is one of the best books for coach travel that should not miss in your endless list of travelling book list. It is an excellent novel by Jack Kerouac a renowned writer and novelist. The book follows on the travels of Kerouac and his friends as they explore many states of the United States. It is a great novel that brings out your sense of adventure as you explore new places. Just pack it safely. Looking for a good travel book as a companion as you enjoy your adventures? Try The Wild Places by Robert Macfarlane. It is an excellent piece of work perfect for long journeys and when you want to enjoy remarkable landscapes in the United Kingdom. Just get a copy. This is a perfect travel book if you are suffering in silence, going through hard times and looking forward to being a better person for the people you love. Tiny Beautiful Things is a great piece by Cheryl Strayed, and it is a powerful piece of work backed up by a collection of letters and essays. It is a great book that will give you hope, and you should feel free to swap with others in the course of your journeys. A fantastic book by Rusty Young, Marching Powder is based on the real-life experiences of Thomas McFadden. The book explores the life of McFadden inside a prison where he was convicted for cocaine smuggling operations. Rusty records Tomas McFadden prison experiences and the final outcome is an amazing book that you will undoubtedly fall in love with. This is a great book that will expound more and leave you fascinated with sightseeing and travelling to unique destinations. It explores the world of Dom Joly and a great writer who has always been fascinated by travelling to odd places that many average tourists would not wish to visit. It is a good read that you will find captivating. Aldous Huxley elaborates his experience on using psychedelic drugs and being under the influence of mescaline on his book. He goes on to reflects more on the intellectual or philosophical effects of his habits in The Doors of Perception; a great book that you will without a doubt you will like. Just pack the book on your next journey and you will love every idea shared. The Lost City of Z is a great piece of work and a masterclass by a reputed author David Grann. It focuses on and tells the activities of Percy Fawcett a British explorer who disappeared in the Amazon together with his son in the search for an ancient city. It is a great book that will keep you glued and captivated until you reach your destination. It is a great book that will definitely enhance your travel experiences to any destination. The novel by Andre Alexis gives an account of a group of 15 dogs sheltered in Toronto, who have language and human consciousness gifts. The story is so amazing and you will love it. The title says it all. Girls Who Travel is a remarkable book that will leave you fascinated and in great moods as you enjoy your expedition. It’s also a great book you can read as you gaze at amazing sights in nearby beaches. Written by Nicole Trilivas, this novel will inspire you to travel to any place you dream of and be the great person you want to be. Written by Alexandra Bracken, Passenger is a great book that will grasp your attention from the first sentence you will open up your reading experience with. It is full of companionship, romance and unimaginable betrayal. It’s a great read, get it before you can load your backpack. The great Thomas Mann was epic and exceptional when writing this one-of-a-kind book. It is a great read, especially if you are visiting new environments as it will keep you busy and glued to every word. Visit The Magic Mountain the easy way by ordering this book and feel free to swap with other readers. Don’t hesitate to make The Secret History by Donna Tartt one of your good travel books. It’s all about a psychological drama set in Vermont, where a group of college friends kill a member of the group and try to cover it up. The book is full of suspense so feel free to go through each chapter and have fun as you travel. This is a great piece of work by David Arnold that is a sharp, dreamlike and sad account of a young girl that you will be glued to read. Don’t want to spoil the fun, just get the book and have fun. Reading is a great hobby. Travelling is good for your soul and mind. It relieves stress and relaxes your body. You can get your favourite book online. With South East Coaches, you will get a chance to read your books as you travel to exotic places. We offer coach hire services in Essex & London.